The main part of this instrument is a gunner's sight and level accompanied by graphical and numerical tables for gunnery, mounted together on an elaborate adjustable foot. 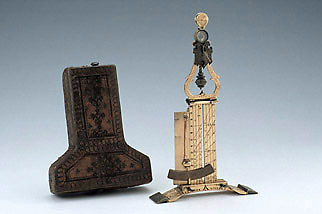 In addition, there is a hinged upper section which includes a decorative plummet, a sundial and a compass. There was once also a further part, signalled by the presence of an additional set of hinges which are now empty. In its combination of military and sundial elements, the instrument might seem to be expensive and unusual, perhaps specially commissioned for a patron. However, several other similar examples are known by the maker Ulrich Klieber (see also Epact 46123). The original wood and pasteboard case survives; it is lined with red leather and covered with tooled leather.